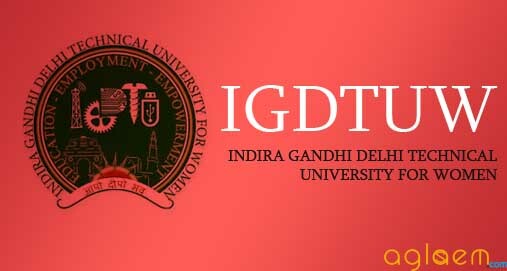 IGDTUW Admission 2019 Indira Gandhi Delhi Technical University for Women (IGDTUW) is contributing to female empowerment by providing higher education courses like B.Tech, B.Arch, M.Tech, MCA, BBA, P.hD. 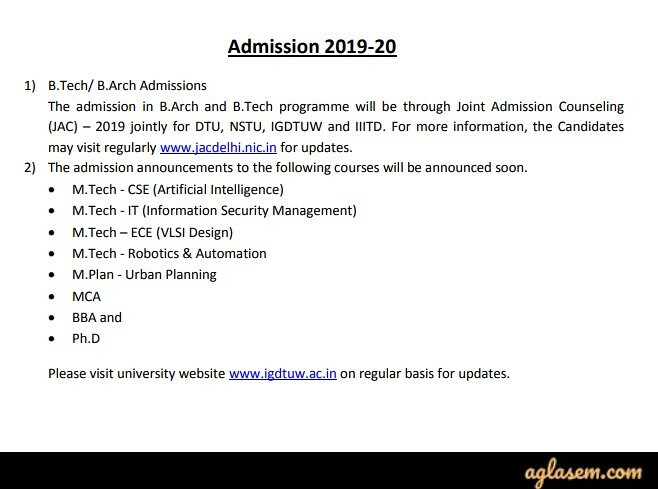 The admission in B.Arch and B.Tech programme will be through Joint Admission Counseling (JAC) – 2019 jointly for DTU, NSTU, IGDTUW and IIITD. The admission notice for the other courses will be announced as per the schedule. Check here all the details regarding IGDTUW Admission 2019 like the application form, eligibility criteria, selection procedure, etc. Latest: The Admission Notice for B.Arch and B.Tech programme has released. Scroll down to check. The selection of the candidates will take place according to the entrance examination. The entrance exam will be organized by the IGDTUW. As of now, the university has announced admission details for B.Arch and B.Tech programme only. The admission notice for the other courses will be announced soon as per the schedule. Candidates will have to ensure that the form is submitted in the prescribed format. Also, it has to be submitted before the lapse of the deadline. An application number will be allocated to the candidates after the successful submitting of the application form. Candidates must keep it safe as it will be required during various stages. Candidates will also need it while contacting the university through any medium. Candidates must ensure that they satisfy the eligibility criteria before applying for IGDTUW Admission 2019. The detailed eligibility criteria, on the basis of last year exam, is mentioned below. Candidates can check for the same. Bachelor’s Degree of a recognized University in any discipline with at least 60% marks in aggregate and must also have passed Mathematics subject (core or elective or functional) at 10+2 level of the CBSE or any other examination recognized as equivalent thereto. OR BCA/BIT/BIS of a recognized University of at least three years duration with at least 60% marks in aggregate or any qualification recognized as equivalent thereto. For Engineering (CSE, IT, MAE, ECE) Degree in M.E/M.Tech or equivalent from a recognized University /Institution in the relevant discipline with a minimum of 60% marks in aggregate or equivalent CGPA & B.E/ B.Tech or equivalent with a minimum of 60% marks in aggregate or equivalent CGPA. For Computer Application (MCA) from a recognized University/ Institution with a minimum of 60% marks in aggregate CGPA & Graduation Degree (with Sciences and Mathematics) with a minimum of 60% marks in aggregate or equivalent CGPA. For Sciences and Humanities (Mathematics, Physics, Chemistry, English) Master Degree in the relevant discipline from a recognized University/ Institution with 60% marks or equivalent CGPA & undergraduate degree in the relevant discipline with 60% marks in aggregate or equivalent CGPA. The Applicant possesses the minimum entry qualification for the degree as given in the admission eligibility for full-time Research Scholars. a. Applicants working in organizations which have MOU with IGDTUW. b. Applicants working on Full-Time basis (regular/ad-hoc/contract) in a National Level R&D Lab/ a reputed organization/ recognized educational institution / university/ PSU/ Corporate/ Industry registered under Company’s Act organization. The admit card will be sent to the registered e-mail id of the candidates before the examination. The necessary instruction/guidelines for the Entrance Exam will be available on the University website www.igdtuw.ac.in. The admit card link will also be present here at the right time for the convenience of the aspirants. The reservation and relaxation policy, on the basis of last year exam, is mentioned here. Candidates can check below for the same. Candidates belonging to Scheduled Castes/Scheduled Tribes will be allowed 10% relaxation of marks in the minimum eligibility requirement and Candidates belonging to OBC will be allowed 5% relaxation of marks in the minimum eligibility requirement. Candidates belonging to Scheduled Castes/Scheduled Tribes will be allowed 5% relaxation of marks in the minimum eligibility requirement. The selection process, on the basis of last year, for admission in various courses is mentioned below. Candidates can check for the same. Admission to MCA program -The admission to MCA program of IGDTUW is on the basis of rank secured in the entrance examination conducted by IGDTUW. 85% of the total seats are reserved for a candidate belonging to Delhi Region (Students passing the qualifying examination from recognized University / College / Institution located within the NCT of Delhi) and 15% of the total seats for candidates belonging to outside Delhi Region. Admission to Ph.D. & JRF Program -Admission process to the Ph.D. programme is common to both categories of applicants i.e. Full Time & Part Time. Full time female teaching staff of IGDTUW. Applicants who have qualified UGC-CSIR-JRF/NET Or have qualified GATE with a score above the minimum cutoff and successfully completed the degree. The detailed fee structure, on the basis of last year, is mentioned below. Candidates can check for the same. IGDTUW was established by the Government of Delhi in May 2013, vide Delhi State Legislature Act 9, 2012. It began as a non-affiliating teaching and research University at Delhi to facilitate and promote studies, research, technology, innovation, incubation and extension work in emerging areas of professional education among women. The main focus of the institute is engineering, technology, applied sciences, management and its allied areas with the objective to achieve excellence in these and related fields. So far, the placement results of the university have been up to the mark and the future only seems brighter. For more information about the IGDTUW Admission 2019 download the Previous Year Information Brochure. 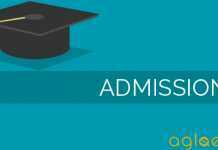 Insofar, Only admission Notice for B.Arch and B.Tech programme has been announced yet. Rest of the details mentioned on this page is based on the last year’s information and should be used for reference purpose only. As soon as the other information will be released, the same will be updated here. I WANT TO ASK THAT SHALL I FILL THE APPLICATION FOR BOTH MTECH PART TIME AND FULL TIME? ?